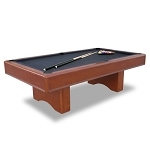 Product: Minnesota Fats Pool Table - 7' Fairfax Billiard Table w/ Ball Return - Free Shipping! This is a great starter table for play areas where space is limited. The table top measures 80" x 44" x 32", making it easier to fit into a smaller space the a full size table, while not compromising game play. The play surface is a comfortable 72" x 36". Material for the body and frame is a light cherry laminate. Also features a ball return system for the pockets providing easy ball retrieval. Billiard Ball Return System for Easy Retrieval. Full Pool Table Dimensions: 80" x 44" x 32". Actual playing surface: 72" x 36". Rail Width 41/2" with inlaid sights. Pedestal legs with 2 1/2" levelers. Professional burgundy cloth playing surface. Accessories are not included with this unit. Unit Weight is about 154 lbs. 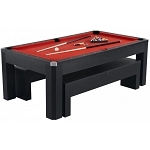 Slate-Core is hard pressed wood wood that will play like a normal pool table top. This surface is used to keep the cost? and weight down without sacrificing smoothness of the playing area. Q: Does this table require installation? 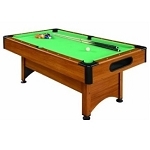 Fast Shipping: Orders for the MFT200 Billiard Pool Table 7 ft. generally leave the warehouse the next business day. Dimensions: 80" x 46" x 8"